5033-5035 North Broadway Avenue in Chicago's Uptown neighborhood. 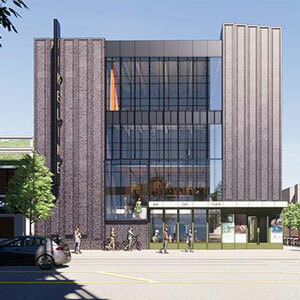 The property, which encompasses a five-story, 45,120-square-foot warehouse building plus a vacant lot near the corner of Broadway and Argyle, is planned as the site of a renovated facility to house the theatre's future operations and to support and expand its mission of presenting plays inspired by history that connect to today's social and political issues. "TimeLine Theatre has been making history for more than two decades, and now it's time to lay the foundation for our next era," said Artistic Director PJ Powers. "We're looking to the future to create a space where TimeLine can grow and innovate-a place that will elevate everything our audience and supporters love about TimeLine, support new artistic possibilities, and fully support our mission." TimeLine has long been bursting at the seams of its current leased home located at 615 W. Wellington Avenue in Chicago's Lakeview East neighborhood, where the theatre has been in residence since 1999. Over the years, it has increasingly faced numerous limitations that constrain artistry, hamper audience accessibility and comfort, and challenge the ongoing financial sustainability that is critical for long-term success. Since 2011, the company has produced one play each season at an alternate venue, including for the past seven years at Stage 773, in order to accommodate a loyal and expanding audience and subscriber base. "It is a proud moment for TimeLine purchasing this building, a long overdue step for one of Chicago's leading theatre companies," said Board President Eileen LaCario. "While the company has reached great recognition in its current location, by stepping into the Uptown neighborhood, TimeLine will have the opportunity to become a leader and partner in the community and share its mission of exploring our world through the lens of the past on a much broader scale." Preliminary plans for TimeLine's new home feature two intimate and flexible black box theatres seating approximately 250 and 150 audience members, respectively, which can both be reimagined for every show. TimeLine's new home also provides an expanded area for the immersive lobby experiences that are a TimeLine hallmark, new opportunities for education and engagement, room to allow audience members to arrive early and stay late for theatergoing experiences that extend far beyond the stage, and more. Once completed, TimeLine's new home will also offer easy access by car from major thoroughfares, enhanced parking options, and exceptional access to public transportation-including the Red Line stop at Argyle, soon to be completely renovated through the CTA's announced Red and Purple Modernization Program. In addition, relocating to Chicago's Uptown neighborhood gives TimeLine a unique opportunity to contribute to an area renowned since the early 1900s as a live entertainment destination. The theater will be just blocks from historic venues like the Green Mill, Aragon Ballroom, Riviera Theatre and the soon-to-be-renovated Uptown Theatre, as well as Black Ensemble Theatre and upcoming arrivals like Baton Show Lounge and Double Door at the Wilson Avenue Theater. "In moving to Uptown, TimeLine joins an incredible neighborhood and a vibrant art scene," said Managing Director Elizabeth K. Auman. "We believe that arts institutions should reflect the needs of the neighborhoods they are in, and we look forward to working closely with the Uptown community to form strong, open partnerships, collaborate on shared goals and contribute another voice to one of Chicago's most diverse neighborhoods." "TimeLine Theatre is a renowned company in Chicago, and we're excited to welcome them to the 48th Ward, joining a host of acclaimed theatre companies in our community," said 48th Ward Alderman Harry Osterman. "This announcement comes after nearly two years of my office working closely with TimeLine to find the right location in our community, and it is great to see it come to fruition. They will serve as a strong anchor on the northern end of the Uptown Entertainment District, and add to the success of the Edgewater Theatre District. TimeLine's patrons will complement the vibrancy around the Argyle business district, and the restaurants and shops in the area will add to an exciting experience for their audiences. We look forward to having TimeLine as a neighbor and partner for many decades to come." "Uptown United could not be more excited to welcome the acclaimed TimeLine Theatre Company to our neighborhood," said Martin Sorge, Executive Director of Uptown United, a nonprofit community and economic development organization that serves Chicago's Uptown neighborhood. "Entertainment and history are two pillars of our community, which makes Uptown the perfect home for a theater company with a mission 'to present stories inspired by history that connect with today's social and political issues.' We're thrilled to see how TimeLine's innovative productions and educational programming will honor our community's history and diversity, and we are excited that they chose Uptown for their future home." The building at 5035 N. Broadway was built in the 1910s by W.C. Reebie & Brother, a moving and storage company founded in 1880 that still operates today. "We are excited to take this more than 100-year-old building and create within it a modern facility that will draw audience members from around Chicago and beyond to experience engaging and thought-provoking theatre," said Powers. "Re-using and revitalizing this building truly embodies our mission of bringing history to life and connecting the past with the present." With the purchase of this property, TimeLine immediately begins the next steps of its new home project. The total project budget is still in development but is estimated to be approximately $20 million, to be paid through a combination of private philanthropy and other sources. The project is expected to take several years to complete as the company moves through overlapping design, fundraising, and construction phases. In the meantime, TimeLine will continue to maintain its operations and present the majority of its productions at its current home leased within the Wellington Avenue United Church of Christ, located at 615 W. Wellington Avenue in Chicago's Lakeview East neighborhood. The property at 5033-5035 North Broadway Avenue was purchased from CEDARst Companies, a diversified holding company headquartered in Chicago with major interests in real estate, hospitality, entertainment, and a number of venture start-ups, which is currently developing multiple new residential projects across and down the street from the future TimeLine location. The sale closed on Wednesday, December 19, 2018 for a price of $2.699 million. "We're excited to see the Timeline Theater Company activate this space and further expand the neighborhood's identity as an entertainment district. It will be a destination for our residents as well as the Uptown community," said Mark Heffron, managing partner of CEDARst Companies. ï»¿Financing for the purchase has been provided by Chicago Community Loan Fund (CCLF). Founded in 1991, CCLF provides flexible, affordable and responsible financing and technical assistance for community stabilization and development efforts and initiatives that benefit low- to moderate-income neighborhoods, families and individuals throughout metropolitan Chicago. "We are thrilled to support TimeLine Theatre Company as it expands to impact a broader audience," said Calvin L. Holmes, CCLF President. "At the same time, we strongly support TimeLine's efforts to provide a gathering spot for thought-provoking productions, audience engagement, and community education in the Uptown neighborhood. CCLF remains committed to supplying capital so community nonprofits like TimeLine have the opportunity to provide positive social and economic support in Chicagoland's neighborhoods."